Introducing Puppy Pullovers by Happy Hookers Detroit!! These custom knitted dog sweaters feature a turtleneck style collar with a convenient leash opening. 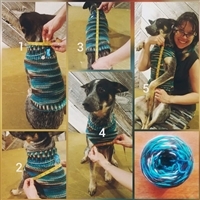 All Puppy Pullovers are knitted in a sturdy acrylic yarn for extended wear and of course machine wash and dryable.